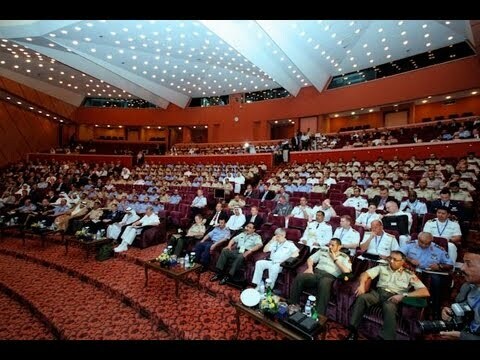 The Third Edition of the Middle East Missile and Air Defense Symposium (MEMAD) was held at the Armed Forces Officers Club in Abu Dhabi on April 11 & 12, 2012. MEMAD was held under the patronage of the UAE Armed Forces and with the full support of the UAE Air Force and Air Defense. MEMAD gathered key decision-makers from around the GCC and key partners from North America and Western Europe to uniquely blend latest insights from government, industry and academia and thereby create the most comprehensive technology-centric forum in the GCC for understanding the critical challenges of emergent missile threats by examinating state-of-the-art missile defense systems against the full spectrum of air and missile threats. The theme for the Third Edition of MEMAD was “Regional Integrated Air and Missile Defense – The Incremental Approach” and key background themes at MEMAD centered on multi-tier missile defense architectures, seamless integration between systems, as well as high level discussions on identifying and plugging capability gaps, and working towards a standardized framework for regionally integrated air and missile defense. MEMAD comprised a high level two-day conference punctuated by numerous networking sessions in a specialized exhibition for air and missile defense technology and solution providers – the exhibition features the Lockheed Martin, Raytheon, Rheinmetall, Boeing, Booz Allen Hamilton, Oshkosh, Saab, SAIC, and the IAMDC in Abu Dhabi. Specialized breakout sessions hosted by technical experts from key private sector partners offered participants value added exposure to the latest developments in missile defense technologies in an interactive atmosphere. Read our post-event synopsis for more details about the proceedings of MEMAD 2012. MEMAD was established in 2008 by INEGMA under the highly prestigious patronage of His Highness Sheikh Mohammed bin Zayed, Deputy Supreme Commander of the UAE Armed Forces and Crown Price of Abu Dhabi, and under the full support of the UAE Armed Forces to facilitate decision-makers from GCC militaries and missile defense organizations to plan and prepare for the most effective missile defense systems anywhere in the world. As the first dedicated missile defense event in the Middle East, MEMAD set the benchmark with speaker panels comprised of Senior Officials and authoritative experts to provide in-depth insights into key strategic themes in integrated air and missile defense. MEMAD offers participants unparalleled discussion and access to expertise that underpins thinking on the development of modern multi-layered missile defenses against the spectrum of emerging air and missile threats in a highly focused environment. Under the patronage of the UAE Armed Forces GHQ and with the full support of the UAE Air Force and Air Defense, the Institute for Near East and Gulf Military Analysis (INEGMA) organized the third edition of the Middle East Missile and Air Defense Symposium – MEMAD, a two-day event held at the Armed Forces Officers Club in Abu Dhabi, UAE. The first day was attended by His Excellency Dr. Abdul Latif Bin Rashid Al Zayani, Secretary General of the Cooperation Council for the Arab States, Vice Admiral Mark Fox, Commander of the fifth Fleet, NAVCENT, United States of America, Lieutenant General Patrick O’Reilly, Commander of the U.S. Missile Defense Agency, Major General (Ret) Khaled Abdullah Al Bu Ainnain, Former Commander of the UAE Air Force and Air Defense and President of INEGMA, Major General Mohammed Bin Swaidan Saeed Al Gamzi, Commander of the UAE Air Force and Air Defense and Staff Brigadier General Majed Al Nuaimi, in addition to international senior high-level government officials from the UAE, the Gulf and abroad as well as high level military officials, key partners from north America and Western Europe, decision makers to discuss and share the critical challenges of emergent missile threats by examining state-of-the-art missile defense systems against the full spectrum of air and missile threats. Riad Kahwaji, INEGMA CEO, opened the conference by welcoming the audience to third MEMAD conference. He thanked the UAE Armed Forces, especially the UAE Air Force and Air Defense Command for their outstanding limitless support for MEMAD 2012, as he also thanked the UAE Armed Forces’ Joint Chief of Staff for their patronage of the event. Kahwaji stated: “Missile and Air defense are essential capabilities that ought to be on the top of priority list of all modern armies. It is no secret that if there were to be any future military confrontation in the region, ballistic and cruise missiles would be the number one threat to Arab Gulf States. The ability of these missiles to carry non-conventional warheads elevates the threat level to an existential and strategic one.” He added: “In line with its mission statement, INEGMA has chosen missile defense as a main topic for its chain of defense conferences out of its appreciation to the importance of this subject to regional militaries of the Middle East, especially the Gulf Cooperation Council.” At the end, Kahwaji thanked all MEMAD sponsors mainly the platinum sponsors, Lockheed Martin and Raytheon, in addition to all media partners. H.E. stated: “One of the top GCC priorities is to establish economic security. We need to establish economic growth, more chances of jobs, education and health care, and keep a secure environment for growth. We don't have enough jobs for our young men. Threats to Gulf and the region are more complex than ever.” H.E. spoke multiple times about sophistication of threats including biological and nuclear terrorism, cybercrime and financial crime all separate from ballistic missile threats and missile defense systems. GCC needs robust defense networks and comprehensive solutions that are practical and not theoretical. H.E. argued: "In war time the most important thing is a civil defense system. Our success will depend on the strength of our defenses. We hope all Gulf countries will be ready to cooperate to solve international and regional problems”. H.E. continued: "Building a comprehensive plan for a missile defense shield is an important strategy for protecting all our countries. Cooperation is practical. It sends a strong message to our allies and enemies. What about our ability to defend against a chemical or biological attack. We should be asking the question: are our air defenses suitable? We have to work more and more especially if we need to build confidence to defend against threats and enemies. We need to develop an integrated missile defense shield. We are asking our allies to help us individually and collectively. The shield (as a solution) should be flexible and comprehensive. It should be a workable solution and not theoretical." The second session chaired by Major General (Ret) Khaled Abdullah Al Bu Ainnain, featured three speakers. Brigadier General (Eng) Jean Luc Combrisson, Director for the Middle East and Africa of the French Defense Procurement Agency, examined “The emerging tactical ballistic missile challenges and countermeasures” He stressed that the French Early warning programme and the Aster System represent cost effective solutions and are based on modular, flexible and interoperable architectures. They will also provide autonomous capabilities adapted to today and expected future threat of interest especially in the Gulf area. MEMAD will resume tomorrow Thursday, April 12, 2012 at 8h30 with two plenary sessions and two specialized closed workshops. The first workshop shall treat the layered integrated Air and Missile defense and the second one shall treat the global, regional and theater architecture. MEMAD sponsors were: Platinum Sponsors: Raytheon and Lockheed Martin. Gold sponsor: Rheinmetall and MBDA. Silver sponsors: Boeing, Booz/Allen/Hamilton and Selex. The first day of the conference ended successfully. The “Middle East Missile and Air Defense Symposium” MEMAD proceeded its activities for the second day at the Armed Forces Officers Club, Abu Dhabi. The conference was organized by the Institute for Near East and Gulf Military Analysis – INEGMA. Lieutenant General (ret) Paul Mikolashek, Former Inspector General in the U.S. Army and Vice President of Middle East and North Africa Development at Raytheon Network Centric Systems chaired the first session that featured three speakers: Colonel (Eng) Gian Luigi Marinoni, Chief of Space Programs, Missile Defense and C41 at the General Secretariat of Defense in Italy, examined “Extended Mid-Tier Defense”. Colonel Marinoni explained Italy’s participation in the NATO European Missile Defense Program specifically concentrating on IAMD in “Plug and Fight” scenarios as well as sea-based missile defense future capabilities. The second session chaired by Dr. Theodore Karasik, Director for Research and Consultancy, INEGMA, featured three speakers. Mr. Mike Bieri, Director of Integration, Program Executive Office, Missiles and Space at the United States of America briefed about “U.S. Army tactical and air defense missile programs overview”. He described the mission of being a trusted worldwide provider of missile systems broken into various categories based on contingencies. He also argued on how valuable the Patriot system is through extensive modernization programs for now and in the future. MEMAD sponsors were as follows: Platinum Sponsors: Raytheon and Lockheed Martin. Gold sponsors: Rheinmetall and MBDA. Silver sponsors: Boeing, Booz/Allen/Hamilton and Selex. The conference concluded with enormous success. Lockheed Martin delivers the breadth and depth needed for ballistic missile and air defense, with the most extensive capabilities across boost, ascent, midcourse and terminal phases. These solutions defend against ballistic missiles, cruise missiles, aircraft and other airborne threats. Our role ranges from prime contractor for integrated air and missile defense (IAMD) weapons systems to developer of critical technologies, such as hit-to-kill interceptors and kill vehicles, seekers, precision pointing and tracking optics, radar and signal processing. Lockheed Martin pioneered hit-to-kill technology in the 1980s, and during Operation Iraqi Freedom, PAC-3 became the first combat-proven system using this technology of choice. With an unmatched record of approximately 50 successful intercepts since then, systems developed by Lockheed Martin, such as PAC-3, THAAD and Aegis, continue to succeed in increasingly challenging tests. Lockheed Martin also provides state-of-the-art IAMD command and control capabilities that enable the optimum employment of weapons and sensors against today's most sophisticated threats. Our planning, analysis and mission execution systems give operators the tools to truly integrate air and missile forces into a seamless airspace defense. Headquartered in Bethesda, Maryland, Lockheed Martin is a global security and aerospace company that employs about 123,000 people worldwide and is principally engaged in the research, design, development, manufacture, integration and sustainment of advanced technology systems, products and services. Providing inner tier air defence systems. Rheinmetall Defence’s Air Defence division, headquarters in Switzerland with subsidiaries in Germany, Italy and Canada, is one of the world’s foremost makers of advanced short range air defence systems. The company leads the global market in automatic gun-based air defence, and is the sole system supplier able to offer sensor systems, fire control technology, automatic air defence guns with Ahead airburst ammunition, integrated guided missiles and a full suite of command and control systems – all from a single source. The successful change of the old GBAD paradigm, to engage the platforms before weapon release, to now ordnance based GBAD engagements has been achieved using the latest available technologies. The use of GBAD systems in Military Operations Other Than War (MOOTW) another Rheinmetall Air Defence speciality, providing coherent command and control allowing to support such delicate missions in peace time environments. The protection of Forward Operating Bases against Rockets and Mortars is the latest addition in an impressive portfolio of inner tier ground based air defence products.